To escape the pressures of saving the galaxy, General Landry has arranged for SG-1 to join him for some R&R at O'Neill's isolated Minnesota cabin. Landry and Mitchell are the first to arrive, and they make an awkward attempt at relaxing, but the rest of the team has been delayed by an offworld crisis. On P9J-333, a large monstrous creature is responsible for the grisly deaths of several villagers. Teal'c and Vala join Colonel Reynolds and his team to investigate, and they too come under attack but are able to kill and capture the alien creature. However, an autopsy reveals a leech-like parasite still very much alive within the carcass of the dead alien monster. With roads and phones cut off by a storm, Landry and Mitchell contend with their own crisis. A hunter has been killed and badly mutilated in the woods, and the sheriff and anxious hunters gather to search for the predator. At the SGC, autopsy results reveal that the alien creature was once a docile herbivore whose DNA was drastically altered by the parasitic leech. When similar gruesome deaths occur on P2R-866, the team realizes that the common element among the planets seems to be visitations by stealth SG teams using Sodan cloaking technology. The Sodan devices are recalled and tested, and a mysterious leech materializes within the invisibility field. Tests of the Sodan device suggest that adjustments to the radiation level have allowed parasitic creatures to bleed through from another dimension and enter indigenous hosts, causing horrific mutations. 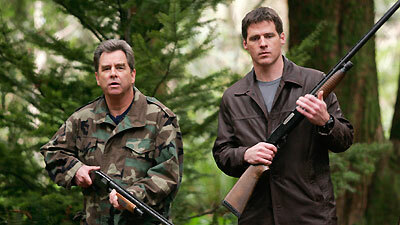 When Mitchell discovers a wounded Trust operative using the Sodan cloak near the cabin, it becomes apparent that the parasites have also been released on Earth, and SG teams arrive to join Landry and Mitchell. As night falls, the teams search the woods and converge on not one, but two hideous creatures, bringing them down with heavy gunfire. With no further signs of alien mutants, SG-1 at last retires to the cabin for some poker and relaxation. Daniel is continuing his research in England. O'Neill now spends a lot of time in Washington. O'Neill's cabin is about a mile northwest of Silver Creek Junction, Minnesota. The Sodan cloaking device is now being used by the SGC for missions that require inconspicuous covert observation. The Sodan cloaking device emits an energy field around the wearer that puts them slightly out of phase with our normal dimension of space time. They also emit a significant amount of radiation which repels interdimensional creatures from bleeding through to our dimension. When SG-1 began using the devices, they shielded the radioactive emissions to make them safer for human use, but unknowingly allowed interdimensional creatures to randomly cross into our dimension. When an interdimensional creature lodged itself inside the stomach wall of an indigenous mammal and began altering the host's DNA, a shy docile herbivore became a large ferocious carnivore. Similar incidents occurred wherever the modified Sodan cloaking devices were being used: P9J-333, P2R-866, and northern Minnesota. While serving in Vietnam, Landry was flying air support out of Bien Hoa when he caught some triple A in the left engine, had to eject, and landed somewhere near the Laotian border well north of the DMZ. He had badly injured his knee, was bleeding badly, and was lost without food or radio with half a battalion of North Vietnamese regulars combing the jungle looking for him. It took him 8 days to reach safety. Landry is fond of chess and is an avid bird watcher, capable of imitating the plaintive mating call of the very rare and endangered Fulvous Whistling Duck. Mitchell is skilled with Playstation Socom 3. Way too much Poker Channel going on here.